Not since its December 2008 blog entry A-Z of Favourite Scholarly Film and Moving Image Blogs has the otherwise intrepid Film Studies For Free ventured into the rather crowded, online territory of end-of-year lists. 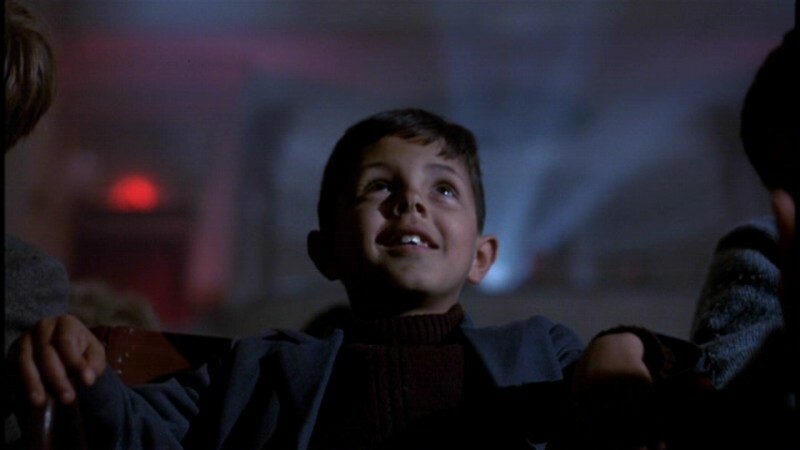 But, as it signs off on its seasonal break until the first few days of 2012, FSFF thought the time was right for a listing of links to its favourite, openly accessible, online Film Studies resources in 2011. Thanks so much to all who worked hard to bring you these openly accessible treasures in the first place. And thanks also, dear readers, for being there to appreciate them. FSFF very much looks forward to seeing you again in the New Year. Tim Smith’s work on how movie viewers watch, showcased here as well as on his blog Continuity Boy and his research site. Double Vision: Links in Memory of Raúl Ruiz, a Filmmaking Legend and ¡Viva Raúl Ruiz! Today, Film Studies For Free joyously tips the wink to its readers about the online availability of video recordings of papers from research events held at the Centre for Research in the Arts, Social Sciences and Humanities (CRASSH) at the University of Cambridge. These valuable online resources will clearly be added to in the coming months and years so while FSFF will keep its beady eye trained for the appearance of future recordings of note, its readers might like to do the same with their own beady eyes. Professor Jay Winter (History, Yale University) ‘Moving Images: From Silent Film to Film Silences in War Films, 1914-2009’. Keynote lecture at CRASSH conference ‘The Moving Image’ (26-27 February, 2010). This paper explores the long history of representation of war in film, from the Great War to the present. It suggests first that silent film provided a form of public séance in an era when spiritualism was at its apogee, and secondly, that it is the silences in later ‘talkies’ which enable us to see how cinematic mourning practices work. Actress Nicole Kidman at the 2011 Santa Barbara International Film Festival. Photograph by Caroline David, shared under a Creative Commons Attribution 2.0 Generic license at Wikipedia. Listen to Pam Cook’s brilliant talk about Kidman’s “commodity stardom” here. Film Studies For Free was thrilled to discover that audio files of the talks from the conference on Age Spots and Spotlights: Celebrity, Ageing and Performance, which took place on December 9, 2011 at Birkbeck College, London, are now available online for listening and download. The talks are of a very high calibre indeed, so several hours of truly worthwhile, scholarly listening await you. Links and a description of the event are given below. Enjoy! Diane Keaton has just published her memoirs. Reflecting on becoming a mother at 50 and kissing Jack Nicholson at 57, Keaton is ageing in her own unique way. On Friday 9 December Birkbeck, University of London, [held] a major research symposium exploring how stars including Keaton, Brigitte Bardot, Nicole Kidman and Elizabeth Taylor aged in the public eye. This one-day research symposium, organised by Dr Janet McCabe and Dr Deborah Jermyn, [debated] two significant (and interlinked) issues; performance and ageing. Encompassing both historical and topical case studies, speakers [considered] a range of celebrities, stars and case studies drawn from different national and industrial contexts. The keynote speaker w[as] Professor Ginette Vincendeau (King’s College, University of London). The co-organisers believe the time is right for new scholarship focussing on ageing and celebrity and for us to think anew about how we think about growing old. We hear endless reports of how age is becoming increasingly relative, ‘60 is the new 40’ and so on’. With the baby boomer generation going into retirement and being reluctant to be written off as ‘old’, there is a heightened demand for positive representations of ageing. At the same time, stars like Helen Mirren are re-writing the rules for older women working in Hollywood, says Jermyn. The symposium addresse[d] some of these issues and ask[ed]s just how much things are really changing, since women stars are still subjected to a much more critical eye as they age than are their male co-stars. ‘Growing old, and I do mean growing’ writes Diane Keaton, ‘requires reinvention’. I like this quote, says McCabe. We must adjust our ideas about how we age without talking exclusively about how we defy the ageing process. This symposium adopt[ed] different perspectives […] about how celebrity is changing our perceptions and attitudes toward ageing and getting older. Introduction and Welcome by Janet McCabe and Deborah Jermyn. Film Studies For Free is delighted to announce the publication of a new film issue of the Open Access journal Situations: Project of the Radical Imagination. The special issue is entitled “Global Cinema: Cinéma Engagé or Cinéma Commerciale?” and it contains ten essays on modern international films and cinemas, including those of Iran, Nigeria, Mexico, Romania, France, China, Argentina, and India as well as on contemporary film festivals and on films documenting the Israeli-Palestinian conflict. The issue has a global reach in its coverage of countries and regions of the world ranging from Hollywood’s own “Global Gaze,” to a placement of Nigerian Cinema as the equal of Africa’s modernist cinema, to Venezuela’s difficult negotiation of a Bolivarian cinema in a neoliberal context, to a questioning of the radical othering of Eastern European cinema whose concerns now seem much closer to those of the West, and, finally, to a tracing of a complex multiperspectival fashioning of the image of the Chinese peasantry in a moment when the distinction between city and country are rapidly fading. The global reach of the issue extends as well to the range of theoretical positions used to examine contemporary global cinema, be it: structural-materialist aspects of the questioning of the Israeli-Palestinian problematic; the integration of economic and aesthetic methodologies in a post-Adornian examination of the Cannes Film Festival; feminist and subaltern theory utilized to critique the patriarchal aspects of what is sometimes viewed as India’s most politically progressive cinema; a rereading and deconstruction of French radical workerist post-1968 cinema; and a linking of feminist and anti-colonial perspectives to highlight the way that in Iran Abbas Kiarostami’s Ten spotlights Muslim women’s emancipation. Below are direct links to the contents, as per usual here at FSFF. Hey readers…. A really quick link today, one specially for the end of a long and tiring teaching term. Film Studies For Free loves this Tumblr by girldetective and hopes that you will find it stimulating, too. Also, must read: Anne Helen Petersen of Celebrity Gossip, Academic Style on the Gosling meme. Hat tip to Nelson D. (aka @nelly061) for passing the link onto FSFF. Film Studies for Free rushes you the wonderful news that a special issue (no. 32) of Screening the Past has just gone online. The issue treats the topic of Screen Attachments and is edited by Catherine Fowler and Paola Voci. The obvious highlight is a brilliant article by Francesco Casetti, but a quick glance at all the other articles indicates a very high quality issue indeed. FSFF‘s own favourite is Fowler and Voci’s study ‘Brief Encounters: Theorizing Screen Attachments Outside the Movie Theatre’, with its compelling use of Sara Ahmed‘s notion of orientation. The Classics and Reruns section also has some real gems. Dynamic Views at FILM STUDIES FOR FREE? 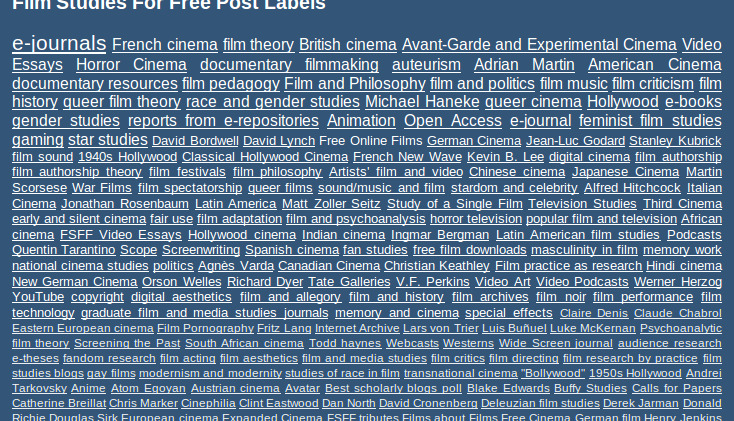 An all too telling image of the messy wondrousness of Film Studies For Free? It is a truth almost certainly universally acknowledged that, in so far as Film Studies For Free is known at all, it is known for its content rather than for its distinctly generic design. But some (long-overdue) design and layout changes are definitely on the horizon in the new year. This website will almost certainly be adopting what’s known in Blogger‘s jargon as a ‘Dynamic Views‘ format, just as soon as some of the gremlins and limitations of this new system are ironed out. The most pressing issue to resolve first will be to find out how to accommodate the veritable riches of FSFF‘s standalone pages and sidebar content in the new format. In the meantime, FSFF would like to offer its readers the chance to express a preference for any of the basic options that it is considering for its makeover. If you click on the links below, you can see how this blog would look in the different dynamic views on offer. Your own dynamic views on this matter would be most appreciated. So, if you have any preferences, or indeed any other thoughts to express about the future look and functionality of FSFF, please leave them in a comment below or email this blog. Read more on the Dynamic View styles. Below, Film Studies For Free links to the entire online contents, to date, of the excellent Open Access journal Studies in Popular Culture: a list of more than 60 great articles on film, television and media studies. The journal of the US Popular Culture Association / American Culture Association in the South, SPC dates back, in its offline, print version, to 1977, making it one of the oldest, continuously published academic journals to treat audiovisual media. SPC has been online since 2006 and is a wonderful example of how an online presence indicates no necessary lowering of the quality bar for a properly peer-reviewed journal. The Legend of Sacco and Vanzetti: Keeping the Story Alive on the Political Left in Literature, Song, and Film — Ron BrileyTamenicia or Tammy; James or Jim Bob; Bessie or Heather: Patterns and Significance of Choosing Names for American Babies — Claude J. Smith, Jr.
Max Ophüls: Interview with Victor F. Perkins from Media Art and Design Studiengang on Vimeo. Casting: Interview with Victor F. Perkins. Death: Interview with Victor F. Perkins. Classicism: Interview with Victor F. Perkins. Orson Welles: Interview with Victor F. Perkins. Film Studies For Free very excitedly learnt of the posting of five more fascinating and hugely insightful extracts from the marvellous recorded interview with legendary film scholar V.F. Perkins which took place at the Kino 8 1/2 in Saarbrücken, Germany, and was filmed by Media Art and Design Studiengang. They are available online here. If you missed the earlier seven interview extracts you can find them in one handy place (and, let’s say it: FSFF is one very handy place!) here. What more need FSFF say, than “Enjoy, enjoy, enjoy, enjoy, and enjoy”! Images from two ‘AIDS film dramas’: above, Longtime Companion (Norman René, 1989), a film which, as Emmanuel Levy puts it, carried “the burden of being the first [widely distributed] theatrical movie to deal directly with AIDS”; below, a frame grab from Yesterday (Darrell Roodt, 2004), about a Zulu woman living with AIDS. Read Jean Stuart‘s and Olaia Cores Calvo‘s articles on this film. Film Studies For Free today commemorates the twenty-third World AIDS Day in the thirtieth year since the identification of Acquired Immunodeficiency Syndrome, or AIDS. The Human immunodeficiency virus [HIV], the lentivirus which causes the syndrome, was identified two years later, in 1983. FSFF marks this anniversary year with the below entry of links to scholarly resources on the figuration of AIDS/HIV in cinema and culture. Today’s posting was also inspired by a series of film screenings and discussions on ‘AIDS and its Melodramas’ that have been taking place at the University of Sussex, UK, organised by Michael Lawrence and John David Rhodes. These academic events will continue next term with screenings of Fatal Love (1991), And the Band Played On (1993), Philadelphia (1993) and, one of FSFF‘s favourites, Boys on the Side (1995). Please email FSFF if you’d like more details.